How do I view my instructor groups in Canvas? As an instructor, you may be part of institutional groups created by your Canvas admins. Canvas helps you access your instructor groups in the Course Navigation menu. If you do not see any groups listed, you have not been enrolled in a group. Note: Instructor groups are separate from course groups. 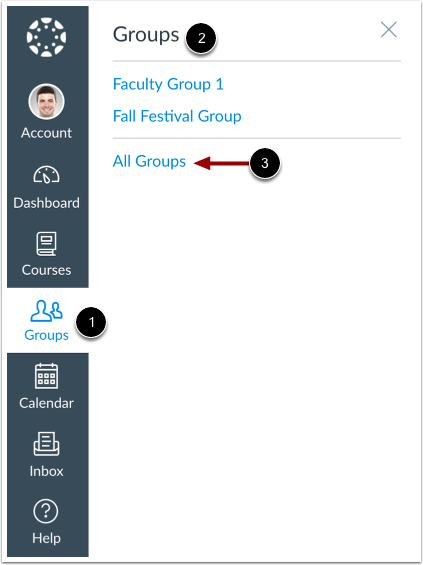 You can access and manage course groups from within a course. In Global Navigation, click the Groups link , then view your groups . To view all your groups, click the All Groups link . Groups that are available to you are listed in blue text . These groups are associated with current courses. To open a group, click the name of the group. Groups under the Previous Groups heading are groups that are part of courses that have concluded. If the group includes a link, the group is still available as a read-only archived group. Prior users can view group material but cannot participate in the group. Previous Topic:How do I view all my Canvas courses as an instructor? Next Topic:How do I customize my Courses list as an instructor? Table of Contents > Global Navigation > How do I view my instructor groups in Canvas?